Amway is one of the world's largest and oldest multilevel marketing companies (MLM). Founded as "JaRi Corporation" in 1949 and renamed "Amway Corporation" in 1959, the company restructured in 1999 and became a part of the Alticor holding company. The same year, Alticor launched a sister company to Amway, Quixtar with a focus on utilizing the internet. By 2001 the majority of Amway distributors had transferred to Quixtar and Amway North America was merged into Quixtar. In 2007 Quixtar announced that they were reviving the Amway brand in North America and the Quixtar name would be phased out. Quixtar, a Virginia corporation formerly known as "Amway USA, Inc." that operates the old Amway sales system in the United States and Canada. Amway has grown fairly quickly since its inception. 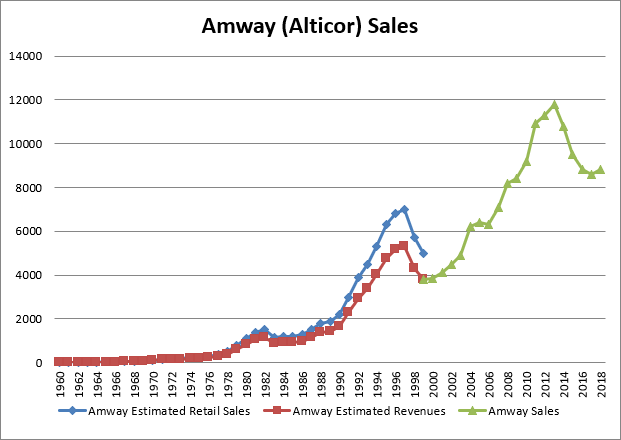 Its historic sales data at estimated retail prices is provided below from 1959 to 2000 (in 2000 Amway switch over to Alticor. At its peak in 1997 Amway estimated retail sales worldwide at 7 Billion USD. With the founding of Alticor, the report methodology was changed and the actual sales to distributors instead of estimated retail sales (ERS) have been reported since 2001. Taking the sales data published in 2001 report into account, the ERS values are about 32% higher than sales to distributors. The actual sales to distributors are marked with *. This page was last modified on 11 June 2009, at 19:53.